GIANNIS ANTETOKOUNMPO LIFTS himself out of his mesh-backed office chair and strides to the center of the Bucks’ locker room. Moments earlier on this March evening, he was eyeing the exit as a media horde questioned him about the Bucks’ 11-point loss to the Rockets, their sixth in seven games. So when One More Reporter approaches him with just One More Question about One More Loss, he barely looks up. The NBA’s offensive explosion leaves defenses helpless, Brian Windhorst writes, plus why the Nets’ offer sheet slump won’t hurt them. “Walk with me,” he says, as he makes his way through the corridors of the Bradley Center toward the players’ parking lot. Passing by maintenance workers lugging heavy trunks, he continues on about the intricacies of the Eurostep — how James Harden uses it to get fouled; how his instincts tell him which way to go-a move that just over a decade ago had no name, had few NBA practitioners and sure as hell looked like a travel. Now? It has changed the way players navigate the defense to reach the rim and, with it, the game of basketball itself. The idea behind the move is laughably simple: In basketball, a player is allowed to take two steps after gathering his dribble. Through most of the game’s history — in the U.S., at least — players, coaches and refs operated as if those steps had to occur in one direction and at one pace. The Eurostep is just a logical development within the rules: The first step goes one way, the second goes in the opposite direction to avoid a defender. To watch any NBA game is to see that the best players on the best teams have mastered the move, each with his own subtle wrinkle. LeBron James does his Eurostep with his elbows high. Kyrie Irving keeps the ball low and finishes with layups off either foot. Russell Westbrook tries to explode into a dunk. Harden extends his arms, daring his defender to foul him. Dwyane Wade drops floaters off his Euro. As for Antetokounmpo? A FiveThirtyEight study showed that he covers just over 15 feet off a single dribble when driving to the basket. Add that to his 7-foot-3 wingspan and he can start his Eurostep from the 3-point line. But if Antetokounmpo represents the final phase of the move’s evolution, understanding its prominence requires a voyage of discovery. You have to go back decades and cross oceans. BELGRADE, 1963. A 15-year-old boy named Vlade Durovic finds a seat in the bleachers of an intimate outdoor stadium that houses the Red Star basketball club, the dominant team in the Yugoslavian professional league. Around him, men light cigarettes. Below, players traverse the sunbaked concrete. Durovic’s gaze is fixed on Vladimir Cvetkovic, one of Red Star’s top scorers. He makes a move toward the basket, and as he enters the lane, he picks up his dribble and takes a hard step with his right foot. Simultaneously, Cvetkovic lifts his left leg for what seems an eternity, balancing on his right leg while waiting for his defender to commit to one side. If his man slides over to cut off the initial angle of his drive, Cvetkovic will simply step to his left and shoot. That move, Durovic says today, was an early-and slow-form of the Eurostep. Now 70 and retired after a successful career playing and coaching in Europe, Durovic has seen versions of that move for nearly 60 years but never thought much of it. “That move was normal in Europe, especially in Yugoslavia,” he says. All of which is why it’s nearly impossible to pinpoint the Eurostep’s Big Bang moment. Instead, it has evolved over time on the hardwood, with Eastern Europe as its incubator — and the mid-1980s as the beginning of the move’s modern era. Back then, Toni Kukoc was a 17-year-old phenom playing for his home club of Jugoplastika in Split, Croatia, where practices routinely lasted eight or nine hours and coach Slavko Trninic emphasized finding different ways to get to the basket. To emulate a defender trying to take a charge, Trninic would place a chair in the middle of the lane, then tell players to dribble from the 3-point line and attempt to finish at the rim. Still, the Eurostep continued to flourish overseas-and at the end of the 1980s, when the NBA began to see an influx of international players, the Eurostep finally gained a foothold in basketball’s highest league. Petrovic joined the Trail Blazers in the 1989-90 season, but it was a fellow rookie that year who would become known for bringing the move into the NBA. Sarunas Marciulionis was a 6-foot-5 guard who grew up in the former Soviet Union and regularly faced Petrovic and his Yugoslavian teammates in international competitions. “They were so good at moving around our big guys,” he recalls, so he began to steal their secrets. The Warriors drafted him in the sixth round in 1987; by the time he joined them for the 1989-90 season, the Lithuanian lefty had perfected the art of taking two steps in any direction on his way to the basket. By his third season, he was slicing through defenses on his way to 18.9 points in less than 30 minutes per game. Even with Kukoc and Marciulionis slithering to the hoop for layups, though, their NBA rivals didn’t bother to adopt the Eurostep. It was almost as if they couldn’t believe what they were seeing. 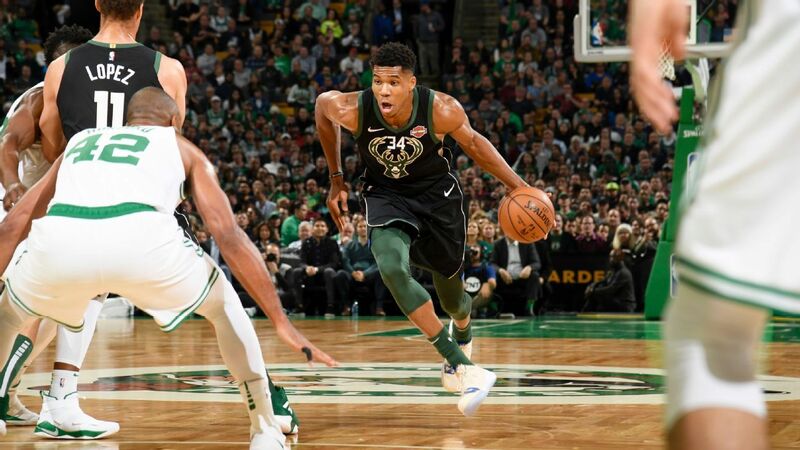 “SERIOUSLY, IT’S GOT to be a f—ing travel.” Chances are you’ve screamed that at your TV after watching Harden or Giannis scoot around a defender with pitter-pat footwork. And it’s understandable. There’s a voice in the brains of all NBA fans that sounds a lot like your middle school gym teacher, and that voice has been telling us for decades that what the Eurostep looks like must be a travel. Still, James Naismith never could’ve envisioned two steps like Antetokounmpo’s. Two steps that cover 15 feet. Two steps that render the area between the top of the key and the basket all but undefendable. The Greek Freak and others have weaponized footwork by stretching the rules to their limit. In doing so, they have fundamentally changed the way basketball is played and how we see it. NBA PLAYERS ARE consistently getting to the rim more often and finishing more effectively when they get there. According to Second Spectrum, team drives rose from 33.8 per game in 2013-14 to 41.4 last season. In 2013-14, players averaged 1.03 points per direct drive on shots near the basket; last season that number was up to 1.07. Tighter officiating, the proliferation of the pick-and-roll and an added emphasis on perimeter shooting have all led to this change, but the Eurostep has been a part of the story as players have sought more effective ways to attack. That would not have happened without Manu Ginobili. Close your eyes, think of Ginobili and some version of this scene might appear: Ginobili, coming off a ball screen to the right of the lane, taking a left-handed dribble at the elbow and closing in on a backpedaling big man. He takes a long step into the middle of the paint, and the big guy, desperate to keep the southpaw from going left, slides over to block his path. Surprise! Ginobili counters with an equally long stride to the right as he blows past the helpless defender for a layup. Unlike his predecessors, Ginobili arrived from Italy at the right time to start a revolution. Suddenly, he was Eurostepping on national TV, with Charles Barkley shouting “Ginobiliiiii!” back in the studio. He was doing it in the NBA Finals, year after year. And before long, he was doing it at a time when a fan could post a clip on social media for all the world to see. It’s no surprise that the first reference to a “Euro Step,” according to a LexisNexis search of publications, occurred in a 2007 article that mentioned Ginobili. He developed moves and countermoves. He could change direction off either foot or fake as if he were going to step across his body and continue in a straight line to the basket. He could set up the Eurostep with a crossover or a hesitation dribble and protect the ball by covering it or wrapping it around his back. Although the flashiness of his Euro captivated the basketball world, Ginobili says it served far more utilitarian purposes. “It was more a survival tool, trying to avoid guys like Shaq, Karl Malone, because if not, I was going to get hurt,” he says. Wade doesn’t remember exactly how he picked up the move — although like everyone else, he credits Ginobili — but he developed his own twist. Whereas Ginobili would take long strides, Wade would take a step to the middle and then a quick step to the side as a way to juke plodding bigs. Wade’s second step was so powerful he could dunk off the move. In recent years, more stars have emerged with their own versions of the Eurostep. None is as hard to stop as Harden’s, and none is as controversial-for a pair of reasons. First, he uses a sneaky technique that makes it appear as if he’s taking an extra stride. A player’s two steps to the basket don’t begin until he has gathered the ball, and as long as his dribble is alive, he can do whatever he wants with his feet-stutter-step, skip, Riverdance. So when Harden attacks the rim, he often pushes the ball far out in front of him and waits as long as possible to gather it while shuffling his feet. Once Harden collects the ball, he manipulates its placement. Sometimes he’ll extend his arms fully, almost forcing the defense to swipe across his wrists. Other times he’ll shove the ball into the defender’s throat so he can’t swipe at the ball. These moves aren’t just effective ways to change direction or draw fouls, though. They also eliminate risk. In basketball, every dribble is dangerous. Every bounce is an opportunity for a defender to knock the ball away. And that’s why Antetokounmpo’s ability to get to the rim from half court with one dribble — with a Eurostep at the 3-point line — is so deadly. He’s playing a different game. FROM THE OUTSIDE, the venerable Bronx gym looks more like a warehouse. But upon entering the building, you know exactly where you are: At the midpoint of the far wall, a massive white sheet hangs from the rafters, adorned with a snorting bull logo and the word “Gauchos” stretched between the horns. On either side of the pennant, eight smaller, vertically oriented banners display names and résumés that are familiar to any basketball fan. Mark Jackson. Stephon Marbury. Kemba Walker. Before they went on to star in the NBA, they played for the Gauchos, the historic New York-based AAU program now in its 52nd season. The sounds of a single basketball bouncing and the raspy voice of coach Dwayne Mitchell echo off the walls as 10 fifth-graders form two lines on either side of the 3-point arc. One by one, the boys dribble toward the basket, where a coach is waiting on the block. When they reach him, they jab their right foot to his side, rip the ball across his chest and take a second step into the middle of the lane. Layup lines now end with Eurosteps. Two weeks later, Tai’s former backcourt mate with the Gauchos, Bernard “Shakes” Bowen Jr., walks into the swanky Sky gym on Manhattan’s West Side. This is Chris Brickley’s office. The 32-year-old trainer has gained recent notoriety for working with a host of basketball’s biggest stars — Carmelo Anthony, Kevin Durant, Donovan Mitchell and CJ McCollum among them. Bowen’s father is close friends with Anthony and regularly takes Bernard to practice with Brickley. The Eurostep is among the moves he teaches-or refines. So Bowen and Brickley run through a series of combo moves together: inside-out dribble into a Eurostep; behind-the-back dribble into a Euro with a leaning finish. Two steps, in whatever direction he desired. It’s such a simple concept, honed on the playgrounds of Argentina, that it was almost impossible for Ginobili to imagine that the move would end up altering the very balance of power between penetrator and defender. That it would inspire actual drills taught by top coaches. That it would lead to thousands of highlights on YouTube. But as he looks back on those early days in South America, where he developed a move that would become his signature, he can’t help but feel a pang of regret.